The following is a reprint of a midweek "Fanfare" column first run two years ago. Hey, it worked for the reprint of the guard column ran two weeks ago, so why not? Plus April is National Recycling Month. Well, maybe it isn't, but it should be. ONE of the months has got to be National Recycling Month, and since I haven't recycled any other columns this year, I'm due. Oh, about that guard column from two weeks ago. I received over a dozen e-mails expressing the following sentiment: "How could you even think about writing a column about the evolutions of guards in drum corps and not include ABC's guard?" To which I replied variations on, "If you would like to educate the readers on the innovations of your favorite guard, please send me something and I will run it in a future Fanfare column." To date, I've heard from one person. My offer remains. 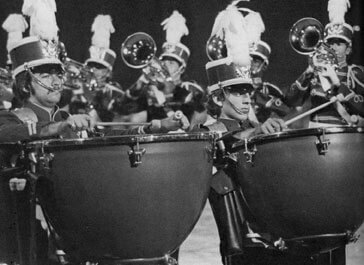 You can reach me at boomike@dci.org At the risk of sounding crotchety and older than dirt, when I marched in DCI (1975 through 1977 seasons), we had timpani (say that word to yourself a few times ... what a funny word ... sounds like it should be obscene) and bells and xylophones (marimbas and vibes were not allowed yet), and we wore them around our necks like God intended. Those of us in the activity who played these instruments were He-men and She-ras of extreme strength, Olympics-ready due to our training to carry these unnatural instruments for hours on end. We didn't realize how silly it was at the time to have five timpani; a corps needed five timpanists to carry the drums. Never mind that it was darned near impossible to find one timpanist with a great ear. Corps had to find four or five of them and hope they could stay in tune during the entire show. This was easier said than done, listening to early DCI recordings of timpani lines going increasingly into the "Twilight Zone" of pitch, where the concept of tuning went to die. That's why it was so captivating to hear an in-tune timpani do an actual solo feature, such as the 1974 offering by Anaheim Kingsmen of the timpani line playing the melody to Mike Oldfield's "Tubular Bells." (Check it out on the DCI Season Pass, or no one will ever love you.) Having a timpani in front of one's body was like carrying a sack of potatoes strapped to one's neck. Only women who had ever been pregnant could sympathize. Polish Falcon Cadets with marching timpanis strapped on. The timpani were cranked by hand. Corps timpanists spent as much time cranking as marching. Many of them gauged how far they should crank by the number of turns rather than the actual pitch, which led to the question why some corps had timpani. Well, mainly because the OTHER corps had timpani. Easy answer. The bells and xylophone were no joy at times, either. Strapped around one's neck, it was hard to move the arms from side-to-side. Corps mallet players in the early years of 1974 (the first year mallets were allowed) through 1976 learned how to play by moving just their wrists, an amazing feat. In 1976-1977, a t-brace was developed that allowed mallet players to get rid of the straps. Ah, total mobility. The only problem was that in getting rid of straps, we also got rid of the cross bracing across the back that distributed the weight so well. The t-brace conveniently transferred all the weight down the spine, pushing down from the shoulders. When the Cavaliers went to this system and switched from xylophone to marimba (now legal) in 1977, I think the effect of the weight on my shoulders could have been traced by me standing next to a doorjamb and having my decreasing height marked with a pencil. Troopers mallet player with old-style strap harness. Writing early mallet parts was simple. The arranger doubled everything in the horn line, whether it should have been doubled or not. And then, for effect, the xylophonist was asked to fill in the gaps between snare diddles, flying over the keyboard with an impressive display of chops and a total disregard for musical sensitivity. As one of those players, I can attest to this. We were heard throughout the recordings, since we frequently stood right by the microphones. Audiophiles hated us. Life was sweet. When I saw the 1977 Spirit of Atlanta mallet line in the corps' premier year, I was flabbergasted. Only two mallet players were still allowed on the field, but Spirit's arranger (former and yet-to-be Cavaliers arranger Dan Spaulding) wanted different sounds at different times, so he took a vibraphone and put it back-to-back with a marimba. The player would flip it over for different sounds. This marcher should have easily qualified for any strongman competition on the planet, and would never be intimidated by any unopened glass jar of condiments. In the mid-1970s, 27th Lancers even had one marcher wear a set of chimes attached to a harness. Actually, the marcher was technically a drum player for the purpose of fitting into the rules, two small drums were mounted inside the harness to appease the rules. The chimes had to be carried at all times to be used, as we did not yet have a pit. It must have been like marching in a prison cell. Timpani were allowed to be grounded up front and be played by one person, provided they were carried on to the field in the traditional fashion. The drums were usually grounded during the standstill concert selection, with the other timpanists picking up accessories (toys, usually Latin rhythm instruments) and playing them, whether the piece called for them or not. 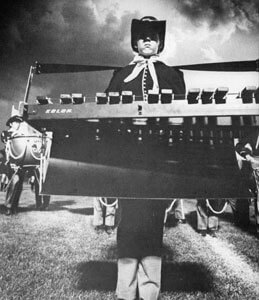 In the late 1970s, the powers that be decided to allow for four mallet players, which opened up the way for most corps to use bells, xylophone, vibes and marimba. Some denounced what they feared would become a marching "Baja Marimba Band." The xylophone, vibes and marimba were actually smaller versions of what you see on the field today. They didn't have the sonority of the full-sized instruments, but they did have the ability to overpower an audio recording, and that's what was important. But then someone finally realized the folly of marching such heavy instruments, and the idea of the pit was born. The first year, in the early 1980s, if you watch the Legacy Collection DVD series, you'll see that only Spirit of Atlanta grounded any mallets, and that was one lone vibraphone. Soon, though, the age of carrying anything that wasn't considered part of the battery (snare drums, tenor drums, bass drums and sometimes cymbals) was over, but not missed. 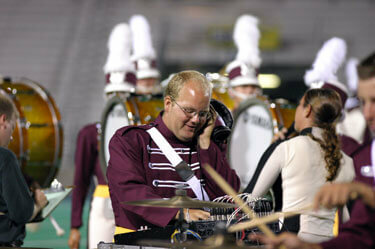 Now we had the "pit" to play with, sometimes referred to as the front ensemble. And play with it, we did, indeed. The pit was an area in front of the actual field. In our best erudite tradition, we thought of the pit as we would think of an orchestra pit for a musical, which is where we got the name. In an orchestra pit, you don't see the instruments. In a drum corps pit, you do see the instruments, but you're supposed to pretend that you don't. And for the most part, I think people have learned to look "through" the pit to the action on the field. Wow, the 40-yard line to the 40-yard line! Within a few years, percussion arrangers filled it up as far as it would go. At one DCI rules congress, it was proposed to widen the pit since we were now trying to fit ten pounds of [censored] into a five-pound bag. That's exactly how the instructor proposing the widening of the pit put it. "What do you play in the corps?" "I play ten pounds of [censored.]" And so we expanded the pit all the way from the 35-yard line to the 35-yard line. A vast new horizon opened up and all were happy, except those who feared that the Baja Marimba Band scenario was really going to take off, and those who grumbled that the 35 to 35 wasn't enough and their corps truck wasn't even near to bursting at the seams. Eventually, the pit became the entire front of the field, allowing instructors to place instruments (and lots of them) wherever they wanted, even inside the field itself if they so desired. There was controversy in the early years about horns and battery percussion coming into the pit area for effect, and this took awhile to iron out. But the important thing is that percussion arrangers were now not limited by the confines of a smaller pit, and they cut themselves loose to their hearts abandon, requiring corps to buy ever bigger equipment trucks, and golf carts, and tractors (for when there became so much equipment the puny little golf carts couldn't pull it anymore), and make little trains out of their equipment, and see who could fill up a pit with the most instruments. I sometimes think there was a contest between the arrangers to see whoever could get the most instruments past their corps budget (and director). The "losers" of the equipment wars would treat the winners to free beer. It was an ever-escalating race equal to anything the USA and USSR had going in space, except when we finally got to the moon, Neil Armstrong and Buzz Aldrin were able to walk across the lunar surface without tripping over equipment stands. Some of the equipment became increasingly exotic. One Suncoast Sound "Florida Suite" show in the late 1980s featured equipment that only a shop teacher could identify; seemingly made of cast off Yugos, old NASA parts and corps buses. Today, it seems that four marimbas and four vibes are the new standard. These are instruments that typically aren't heard very well by their lone self, so they need to be doubled, tripled and quadrupled in numbers to have a presence. With the move from the key of G to the warmer and less shrill key of Bb, the xylophone has all but disappeared due to its innate ability to be easily overused, which used to be most of the fun. When found, it is usually a small keyboard attached to a larger instrument and is only used to sporadic color due to its ability to cut through lead. 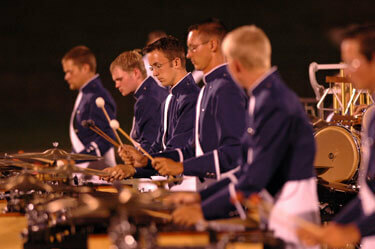 2005 Bluecoats amongst full front ensemble accoutrements. After amplification was voted in, I asked a percussion arranger if the availability of amplification meant he could now get rid of some of the pit mallet instruments, as he wouldn't need so many for the volume. He looked at me as if I had proposed he cut off his parts of his own body. The message was clear: "I fought hard for these toys and the only way I'm letting go is when someone pries my cold, dead fingers off of them." In addition to mallet keyboards and timpani, we have any number of drums and a variety of color instruments. Ethnic instruments have become the rage the past few years, as "World Percussion" became part of our syntax. The maximum corps size was expanded from 128 to 135 primarily to accommodate the increased number of players in the pit. College music majors found they could join a front ensemble and not even know how to spell the word "rudiment." (I guess this also goes for some snare lines as well, but that's a different column.) Some ask, "Are these kids marchers? Can they say they 'march' in a corps?" I don't know. Although they don't "march" in the traditional sense, watch what they do. They're constantly moving from a keyboard to a pair of cymbals (no less than six different-sounding pairs in a pit will do) to a suspended cymbal (at least a dozen of those) to special sound effects (brake drums, triangles, gongs), back to the mallet instruments, and then to the ethnic drums and accessories. The kids of the front ensemble get a real workout, almost ballet-like in appearance due to having to contort their bodies to move from one spot to another without knocking into any of the instruments. Usually, the pit blends in and reinforces the show. But sometimes, it stands out and slaps fans across the face with either some incredible flurry of notes or some tender and tranquil effect that oozes beauty. The most incredible mallet feature I remember from recent years is Blue Devils' remarkable full mallet ensemble soli riff during "Methods of Madness" (2000). It was a mallet feature that never failed to generate enthusiastic applause, which is something rather rare, as pits are usually supporting characters and not the main actors. It's not that fans ignore the pit, but people do tend to look right through it to view the drill being staged on the field. Some pits may now look different to people because of the electronic amplification in use including mixing boards, cords and microphones. Who knows if synthesizers and electric basses are in the future? When I was carrying the xylophone or marimba around my neck, I couldn't imagine a day when a corps would share the field with more percussion instruments than found in a typical music conservatory. With that in mind, I guess anything can happen if the instructors and directors will it. Electronics, the future of front ensembles? The pit has allowed field percussion music to be much more musical than ever before. It has attracted more music majors to corps. It has challenged staffs to maximize space on their equipment trucks. It has become more a part of the field than an appendage. And, most important at this wee hour of the morning, it has allowed me to reflect on the dictionary definition of the word, at least the one that seems to make the most sense in concurrence with how we use the word: 15. an area filled with a particular material or substance Doesn't the dictionary glamorize everything?